SINGAPORE - Registration for children starting Primary 1 (P1) in 2019 will begin on June 28 and end on Oct 31, the Ministry of Education (MOE) said. All primary schools will be open from 8am to 11am, and 2.30pm to 4.30pm from Mondays to Fridays, the ministry said in a statement on Friday (June 1). Children born between Jan 2, 2012 and Jan 1, 2013 have to be registered at the exercise for admission to P1 next January. The earlier phases - 1 and 2A - are for children whose siblings are current pupils of the school, children whose parents are members of the alumni association, or who are members of the school advisory or management committee. Parents registering their younger children under Phase 1 can submit the registration form and documents through their older children, who will be given the form by their schools. Phase 2B, which will begin on July 19, is for children whose parents have volunteered in schools, have affiliations to churches or clan associations, or are active community leaders. Those with no links to the schools will have to register in Phase 2C, starting July 31. Parents can register their children in Phase 2C and 2C Supplementary via the Primary One Internet System (P1-IS) using their SingPass. P1-IS will available 24 hours a day from 9am on July 30 to 4.30pm on Aug 1 for Phase 2C registration, and 9am on Aug 13 to 4.30pm on Aug 14 for Phase 2C Supplementary. MOE advised parents to set up their SingPass two-factor authentication early if they intend to use the system. Those who choose not to do it online can also register in person at their schools. 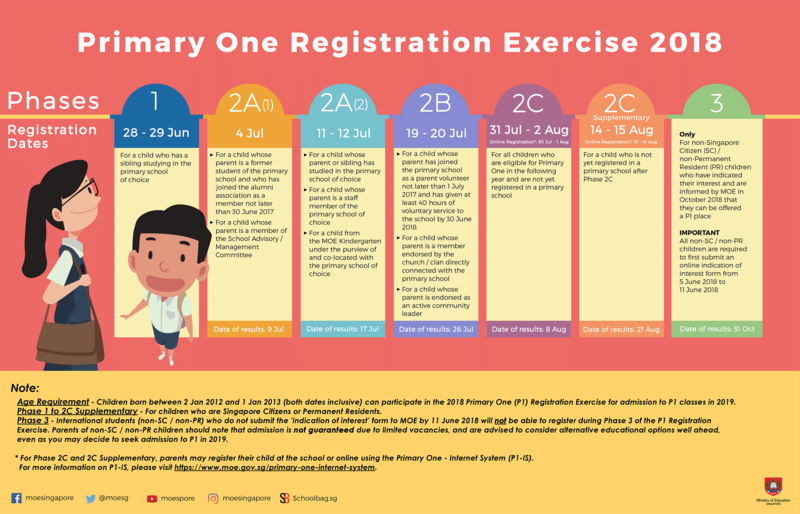 Primary 1 registration: Is balloting likely at the school of your choice? This will be the first time that computerised balloting will be used in the annual exercise, since MOE announced that will be replacing the manual process in March. This means that parents will not have to go down to the schools for balloting, which is usually done when the number of applications exceeds the vacancies at a school during the registration phases. Also in a first this year, international students will also be required to undergo a two-step process ahead of the registration exercise. From June 5 to 11, they will have to submit an "indication of interest" form online via MOE's P1 website. International students will be notified in October if they can be offered a place, after which they must register in person at the school during Phase 3. The "indication of interest" is not considered as registration, and admission into a school for international students is not guaranteed, MOE said. Children who have secured places in primary schools under the home-school distance priority scheme will be required to live at the address for at least 30 months from the start of the P1 registration exercise. Those found to have supplied false information will be referred to the police for investigation.